The numbers in a business are the instrument panel by which an owner should run his business. It still amazes me how many business owners we talk to have no idea and no interest in their numbers – until it is too late! That’s why there are many businesses out there with too many ONE’s in the business. ONE major client. Even with contracts in place there are many ways you can lose the client and if you do then your business is likely to fail. ONE supplier. Again, even with contracts in place risk is real. The supplier could go out of business or cancel the contract. ONE key ‘expert’. What happens if the ‘expert’ leaves the business, suffers ill-health or is poached by a competitor. ONE key employee. Some businesses rely on one key person (or owner) to do everything. All the knowledge is “in their head” and that is a major risk. ONE product or service can become a problem. If that product or service goes out of favour (e.g. video hire, photographic processing etc.) or people buy cheaper over the internet or from overseas suppliers, then you are in trouble. I could go on but I’m sure you have got the message. I’ve used the word ‘risk’ a lot and that’s because it IS risky having ONE’s in your business. So what do you do about it? Well the starting point is to conduct periodic “risk analysis” assessments. It doesn’t need to be onerous and is best done on a continuous basis. At your regular management or team meetings, take different parts of the business each month (or period) and brainstorm the risks with your team. It often improves the process if you have your external Business Owners Board chair / coach involved in these sessions because they are not too close to the business, or emotionally attached to it, they will ask better, probing questions. When you have identified the risks, categorise them by using the LIKELIHOOD / IMPACT process. Assess how likely things are to occur and then assess the possible impact on the business. For most businesses it is sufficient to score IMPACT and LIKELIHOOD as HIGH, MEDIUM or LOW. Then prioritise the risks starting with the ones which scored HIGH on both LIKELIHOOD and IMPACT. Now brainstorm ways to mitigate the risk. As they say – forewarned is forearmed! As well as assessing the ONE risks, consider trends and external risks, such as the falling Australian Dollar, rising unemployment, the downturn in the mining, resources and manufacturing sectors and things like government legislation and changes in government. ← Does Your Business Run Like A Well Oiled Machine? Very true. Almost half the SME’s located in the WTC did not reopen after 9/11. The loss of key expertise, and data that wasn’t properly backed up simply prohibited it. Thanks Steve for your comment. It makes the point very well. As an engineer I used to try and avoid a ‘single point of failure’ in any piece of equipment. In business it is exactly the same. 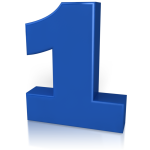 I get business owners to list for me all the single points of failure in their business – all the “1”s.